This is a very enjoyable concert of quite disparate but masterful works. Seeing this concert on Blu-ray may well make you wish you had been in the audience in Royal Albert Hall on the July night these performances were recorded. Indeed, those in attendance were very fortunate and showed their appreciation with lavish applause and cheers. Conductor David Zinman leads off the concert with a somewhat briskly paced Till Eulenspiegel lustige Streiche. The album booklet gives the timing for this performance as 15:22, which includes applause, but I clocked it at 14:43. Consensus timings for this piece run from just over fifteen minutes to slightly over sixteen. So, Zinman's tempos are not overly brisk. Moreover, he makes his way with the music work: this is a colorful, witty and accurately played rendition, in which the conductor misses no subtlety or beauty in the score. Zinman is and has been one of the finest, if slightly overlooked conductors on the world's concert stages for some time. His orchestra, the Tonhalle-Orchester Zürich, has rightly been garnering substantial praise of late for both their recordings and concert performances. This excellent Till Eulenspiegel is further evidence of their collective talents and consistency. Julia Fischer turns in a splendid account of the Dvořák Violin Concerto. She plays with her usual fine sense for judicious tempos, a wide range of imaginatively applied dynamics, beautiful intonation and spectacular technique. She is very poetic in the lovely second movement and in the outer panels she plays with a true dynamism, catching all the drama and joy in the music. Zinman and the Tonhalle players support her quite well throughout. I cited Fischer's technique above: you may well watch and listen in awe to her incredibly subtle and utterly dazzling encore performance of the finale of the Hindemith Solo Violin Sonata in G minor. Julia Fischer is a hugely talented artist who also happens to be an accomplished concert pianist, having recently recorded the Grieg Piano Concerto to great acclaim. Like his Till Eulenspiegel, Zinman's Pastoral Symphony is paced quite briskly, which as far as I'm concerned is a good thing, especially when the phrasing is so well imagined and the playing so good. To give you an idea of Zinman's tempos, they are very similar to those of Claudio Abbado in his two versions of the symphony with the Berlin Philharmonic Orchestra (EuroArts Blu-ray 2057374). This is one of Beethoven's most thematically repetitive symphonies – especially in movements 1, 2 and 5 – and so lingering over phrases and dotting every "I" and crossing every "T" is not a wise course to follow. Actually, I think those three movements come across quite well here, imparting a truly pastoral sense in their joy and serenity. But the Peasant's Merrymaking and Storm movements are also very convincing, not least because the orchestra delivers a very committed and precisely played performance. There is a brief encore, Evviva I soci, in an arrangement by Florian Walser. It is great fun all around and features three extra percussionists dressed in street clothes, one of whom provides humor in his manner of playing wooden spoons against a colleague's arms and head! 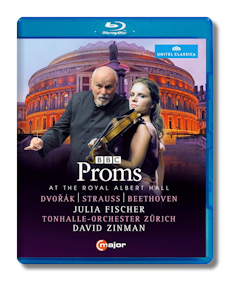 While you can find many superb performances on record of the three major works in this concert, none of them on this disc is less than excellent, and the Julia Fischer Dvořák Violin Concerto is nearly in a class by itself. The camera work, picture clarity and sound reproduction are first rate. Highly recommended!